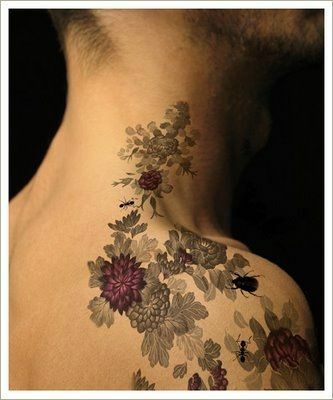 Beautifully-detailed purple flower tattoo for men, reaching from the neck onto the shoulder and arm. Flower tattoos aren’t just for girls anymore! This flower tattoo for men is inked in incredible detail and features a great use of purple, grey and black colors to really make it stand out against his skin. The traditional flower tattoo is so realistic, it even includes a few bugs! Included in the neck and shoulder tat are a couple ants and even a little beetle too. Some of the blossoms are purple and some are grey. Flower tattoos have traditionally been reserved for women, but now men are embracing certain floral designs too. While most flower tattoos for men are inked on the arm, back or leg, this man’s flower tattoo is inked on his neck and shoulder, which makes it unique and interesting. In this flower tattoo, the sparse but dramatic splash of purple really makes the tattoo design pop.